﻿ Best Price on Aguila de Osa Inn in Drake Bay + Reviews! Located by the mouth of the River Aguijitas just outside Costa Rica’s Corcovado National Park, this eco-friendly hotel offers amazing views of Drake Bay. The charming rooms have a private terrace with sea views. 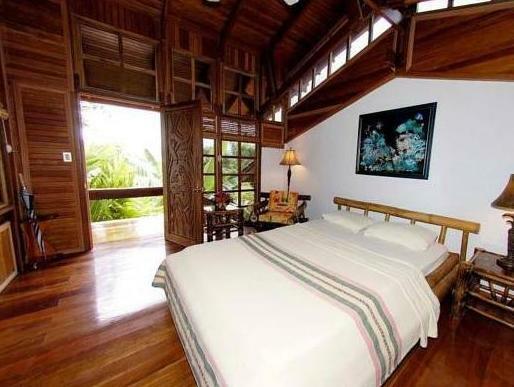 The rooms at the Aguila de Osa Inn feature traditional, hand-crafted interiors with high ceilings. It comes equipped with a minibar, coffee maker and ceiling fan. The stylish bathroom has a hairdryer. The open-air restaurant serves gourmet food, including fresh fish and organic vegetables, with great views of the bay. There is also a bar serving cocktails and other drinks. The Aguila de Osa offers a range of tours and trips into the jungle. Guests can go scuba diving and whale watching nearby. Please note that the Hotel is closed during October. When booking the half-board service, please note that drinks are not included with the meal.